In 1990 ethnic Nepalis were expelled from Bhutan, and have been displaced in Nepalese refugee camps ever since. But there’s a rift between generations as younger people hope to resettle in the USA, whilst their parents and grandparents are still desperate to return to Bhutan. “Look how happy we used to be,” says Harka Jung Subba, pointing to a family photograph hanging on the bamboo wall of his two-bedroom hut. The picture, which shows him, his wife and their six sons and daughters, was taken when the family still lived in Bhutan, more than 20 years ago. 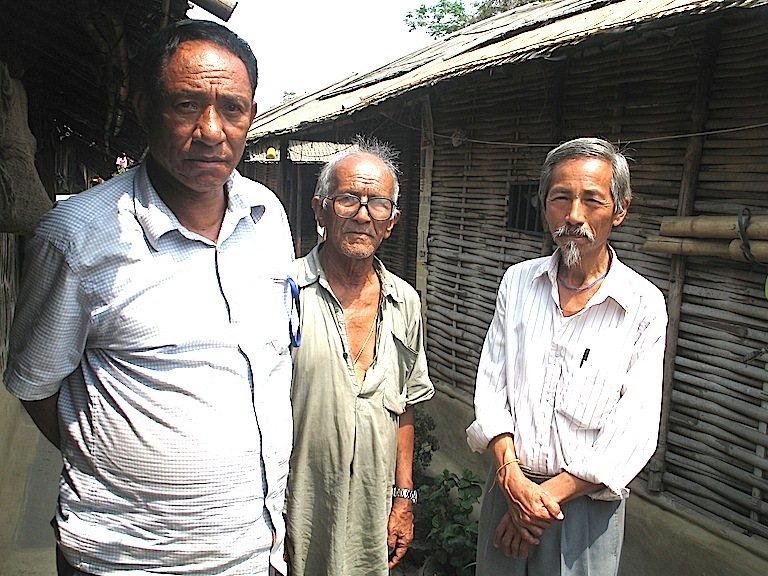 In 1990 they were forced to flee as a result of the increasing persecution of ethnic Nepalis. He did not think they would be away for long – just long enough for things to settle down again. 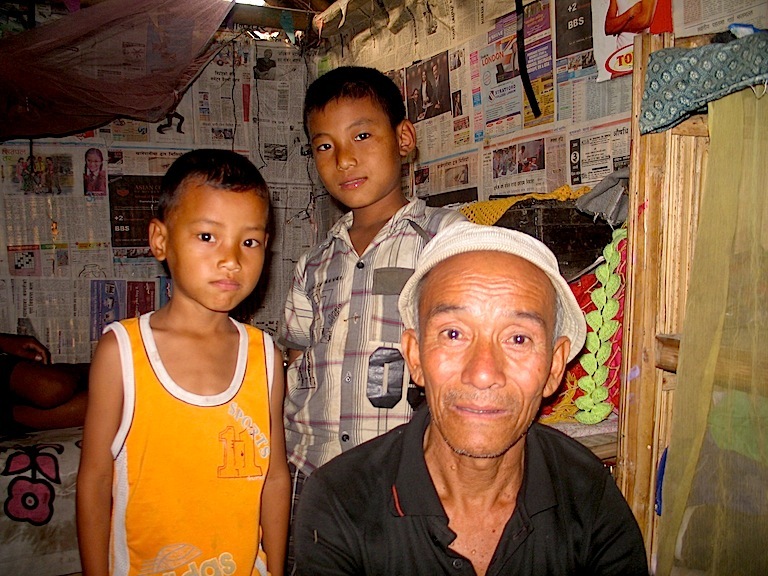 But Harka and more than 100,000 other Bhutanese refugees have been living in refugee camps in Nepal ever since. These days, the photograph reminds him of a growing rift between him and his children. His son, Ram Kumar, seen peering out of the picture as a young boy, moved to America last year with his wife and two children as part of a United Nations resettlement programme. Fearful that his father would not give his consent to let him go (the UNHCR requires all members of a household to attend the verification interview for resettlement), Ram, 33, left with his mother’s blessing while Harka was in India last year lobbying Indian politicians and rights activists to pressure the Bhutanese government for repatriation. “My son, who grew up in my arms, left without saying goodbye. I am sure I will never see him again”, says Harka bitterly. His other sons are now also pushing him to let them leave the camp and settle in a western nation. This is just one example of an issue that is splitting the refugee community in two. For the younger generations of Bhutanese refugees, who have lived in the camps all their lives, reliant on hand-outs and aid as they are forbidden by law to work, the resettlement programme is their only way out. But the older refugees, who do not speak English, have no desire to move away from their community to a foreign country with an alien culture. Increasingly the young are leaving while the elderly are left behind. Harka, 68, admits he is fighting a losing battle against his now grown-up sons. While he and other, older refugees continue to hold out for repatriation to their homeland, the younger generation want to start new lives abroad. So far resettlement has been the only solution offered to the refugees. In 2006, following 15 rounds of failed bilateral negotiations between the Bhutanese and Nepali governments, the US government offered an alternative to returning to Bhutan: moving to America. Within a year more than 25,000 refugees had applied for resettlement. Almost 29,000 refugees have now been resettled, mainly in America, although a small number have also moved to Australia, Canada, Denmark, Norway and the Netherlands, according to the UN’s refugee agency, the UNHCR. A further 15,000 are expected to be resettled by the end of this year, while 50,000 more have registered for a “Declaration of Interest on Resettlement”. Harka was one of the first 100 refugees to arrive in Damak, one of the six refugee settlements in Jhapa district in south-eastern Nepal. He says they had a good life in the tiny Himalayan kingdom, where he was a respected government official and owned a large farm. But in 1989, threatened by the increasingly prosperous Hindu Nepali-speaking minority, the government imposed a policy of so-called “Bhutanisation”. Under the policy, also known as “One nation, One people”, only Buddhism, Bhutan’s main religion, could be practiced, while a Bhutanese dress code, culture and language was enforced throughout the country. Many of the ethnic Nepalese had their land confiscated and were stripped of their citizenship. One day Harka says he protested against the arrest of some of the key Bhutanese democratic leaders. Afterwards he was threatened by Bhutanese government officials, including members of the army. Fearing severe repercussions, he fled the country. After he left he says the army raided and seized his house. 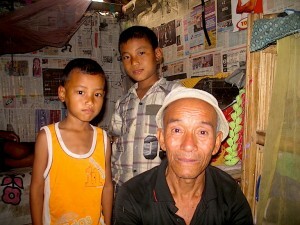 Harka and his family lived in Tsirang district, in south Bhutan. The fertile area, set in the foothills of the Himalayas, is lush and green, known for its gentle slopes and mild climate. Farmers grow rice, maize and millet, while major cash crops include orange, mandarin and cardamom. Now Harka’s home is a two-room hut. With mud floor, bamboo walls and a roof made from bamboo and tree branches, it can barely fit two beds so the family take it in turns to sleep on the floor. 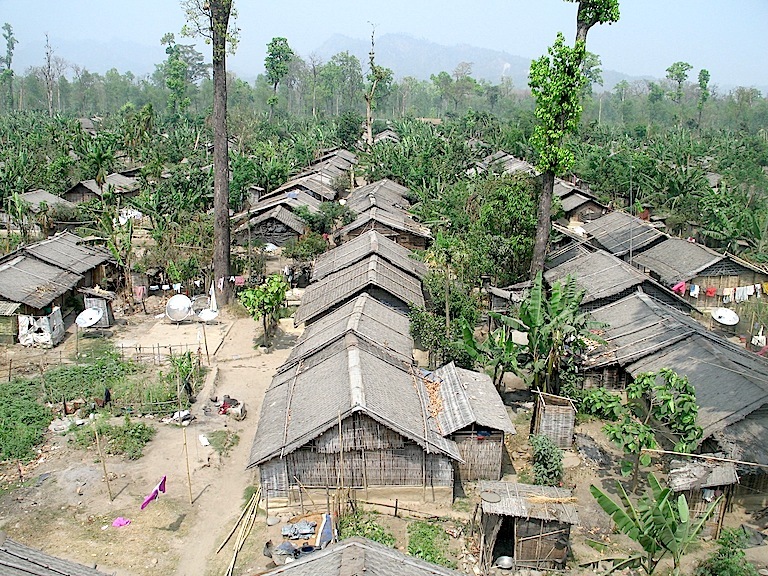 The camp has no electricity and the sanitation system is poor – large pits are dug as a crude way to contain sewage. There isn’t enough water and Harka says they have no access to newspapers or television. In the dry summer months temperatures can reach 45 degrees and the camps are prone to accidental fires, while in the monsoon low-lying Damak is vulnerable to flash floods. In the winter the bamboo walls do little to keep out the cold and fog. Harka and fellow refugees, such as 60-year-old Maniraj Lama (left), long to return to their old, peaceful lives in Tsirang. “We have waited this long and we still can wait to go home,” Maniraj says. But their children have seen them fight in vain for 20 years and don’t want to spend the next 20 years doing the same. Twenty three-year-old Sandeep Bhattarai doesn’t remember Bhutan. He sees the resettlement programme as his only way out but his father refuses to give him permission to leave. “I still have the ability to start something new”, he says, angrily. “There is a second chance for me to get out of this misery.” The eldest of three siblings, Sandeep wants to resettle in the US. Sandeep works as a volunteer in a local school in the refugee camp for a small allowance. He says most of his friends are now school graduates or have finished college and are pursuing further studies. Under Nepali law the refugees are not allowed to work, although Sandeep says the rules are not strictly adhered to. However, high unemployment means there are very few jobs in the area and even if they find one, they get paid less than other workers. “As soon as I show my identity card and reveal my refugee status I get half of the salary compared to Nepali citizens,” he explains bitterly. Jiten Subba, a Bhutanese journalist in exile in America, says the resettlement helped to reduce the violence, crimes and insecurity among the frustrated youth in the camps as many started to concentrate on improving their skills with hope of finding better jobs in the new countries. But for every success story that filters back from resettled refugees – such as Ram finding a job – there are stories of hardship and isolation. Bhutanese journalist Thakur Prasad Mishra, known as TP Mishra, grew up in the refugee camps in Nepal but moved to New York as part of the resettlement programme in July last year. He explains that most of the older refugees who have resettled suffer from depression. But he warns that elderly people with no children are better off staying behind. “They will have a tough life without children at home to assist them after resettlement,” he said.